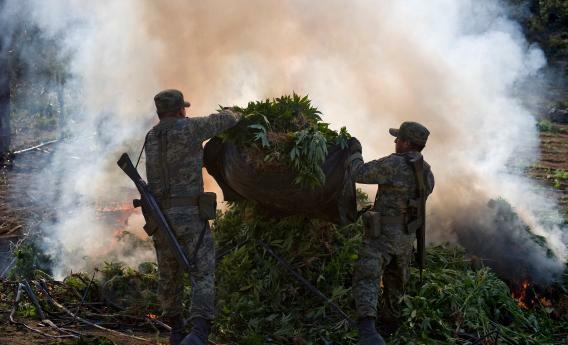 Surveillance technology in Mexico's drug war. As a new president prepares to take on Mexico’s drug war, the country’s army is turning to high-tech spy technology. But could it be used for more than just monitoring criminals? Mining text messages from mobile phones, intercepting voice calls and emails, logging instant messages—even covertly turning on a mobile phone’s microphone so it can be used to record and transmit audio without the knowledge of its owner. These are just a few of the things surveillance software owned by the Mexican army can do. That’s according to secret contracts published last month by the Mexican newspaper El Universal, showing deals made between 2011-12 by a top army general for more than $350 million worth of spy gear. The mobile phone eavesdropping technology appears similar to that offered by companies like England’s Gamma Group. Rather than conducting a wiretap via a telecom company, such tools allow authorities to lodge Trojan-like spyware on phones to mine data and record conversations. But it doesn’t end there. Aside from purchasing mobile phone surveillance technology, the Mexican Department of Defense, which confirmed the contracts were genuine, also reportedly splashed out on a kind of radar scanner that allows them to see through walls. These devices have been available to law enforcement agencies for several years, but little is known about where or when they are used. Similar technology was designed by a British company in 2006, and last year researchers at MIT announced that they had developed an “urban war fighter” radar to detect movement through walls from up to 60 feet away. Mexican reporters have also been focusing on the shadowy company named in the contracts as the provider of the technology. Security Tracking Devices, which does not appear to have a website, is listed online as being based near Guadalajara in the state of Jalisco. But El Universal tracked the address to a run-down residential area, where it reported it found no evidence of the company’s existence. The Electronic Frontier Foundation last week criticized the purchase of the technology disclosed in the secret contracts, saying it builds upon a trend of Mexico increasing its surveillance capacity. Mexico has had ongoing help from the United States to install up to 107 monitoring stations for intercepting communications nationwide. For these reasons, it doesn’t seem far-fetched to suggest that the spy tools could quite easily get into the wrong hands, deployed by corrupt authorities to monitor political opponents or anyone else deemed a threat to drug cartels’ grip on power—like journalists. The technology may have been purchased to help fight crime, but it seems almost unavoidable that it will end up being used occasionally to commit crime, too. Thanks to Shauna Dillavou for help with Spanish translation.